In this Proxy Statement, the terms Apple, we, and our refer to Apple Inc. Information presented in this Proxy Statement is based on Apples fiscal calendar, other than references to particular years in the biographies of our directors and executive officers, which refer to calendar years. The information contained on apple.com is not incorporated by reference into this Proxy Statement. To transact such other business as may properly come before the Annual Meeting and any postponements or adjournments thereof. We are pleased to welcome shareholders to Steve Jobs Theater at Apple Park for the 2019 Annual Meeting. To make sure we can accommodate as many attendees as possible, we have established a registration process. Shareholders will need to register in advance at proxyvote.com beginning at 8:00 a.m. Pacific Time on February 6, 2019 and registration will be on a first-come, first-served basis. Only shareholders as of the Record Date who have registered in advance and have a valid confirmation of registration will be admitted to the meeting. Please note that due to space constraints and security concerns, we will not be able to provide access to the Apple campus to any shareholders who have not registered in advance. Your proxy materials will include a unique control number to be used at proxyvote.com to vote your shares and register to attend the meeting. If you have any questions about proxyvote.com or your control number, please contact the bank, broker, or other organization that holds your shares. The availability of online voting may depend on the voting procedures of the organization that holds your shares. No recording is allowed at the Annual Meeting. This includes photography, audio recording, and video recording. In addition, the use of mobile phones, tablets, or computers is strictly prohibited. Attendees are welcome to visit the Apple Park Visitor Center after the Annual Meeting, but we are not able to accommodate tours of the campus. Even if you successfully register and plan on attending the Annual Meeting in person, we encourage you to vote your shares in advance using one of the methods described in this Proxy Statement to ensure that your vote will be represented at the Annual Meeting. We reserve the right to revoke admission privileges or to eject an attendee for behavior likely to cause damage, injury, disruption, or annoyance or for failure to comply with reasonable requests or the rules of conduct for the meeting, including time limits applicable to those in attendance who are permitted to speak. This summary includes the proposals to be acted upon at the Annual Meeting, as well as business highlights from 2018 and executive compensation and corporate governance information. In addition, this summary provides a brief description of Apples values. Apples 2018 financial results broke new records, and we achieved significant milestones across the company. 2018 net sales set a new all-time record, and both net sales and operating income grew 16% compared to 2017. Earnings per share grew 29% compared to 2017. Our executive compensation program is designed to motivate and reward exceptional performance in a straightforward and effective way, while also recognizing the remarkable size, scope, and success of Apples business. The 2018 compensation of our named executive officers has three primary components: annual base salary, annual cash incentive, and long-term equity awards. For a detailed discussion of our executive compensation program, please see the section entitled Compensation Discussion and Analysis beginning on page 28. Our corporate governance structure fosters principled actions, informed and effective decision-making, and appropriate monitoring of compliance and performance. For a detailed discussion of our corporate governance and directors, please see the section entitled Corporate Governance beginning on page 7 and the section entitled Directors beginning on page 15. Apple believes accessibility is a fundamental human right and technology should be accessible to everyone. Our products are powerful and affordable assistive devices, with built-in accessibility features such as VoiceOver, Switch Control, and support for Made for iPhone hearing aids. In 2018, we expanded our Everyone Can Code initiative with resources specifically tailored to support students who are blind, deaf, or have physical motor limitations. For more than 40 years, Apple has worked alongside educators to unleash the creative potential in every student. We launched Everyone Can Create to help bring creative expression into the classroom. And Apple Teacher, our free online professional learning program, helps teachers get the most out of Apple technology. We continue to work closely with schools to raise the bar for whats possible for learning with technology and to prepare students for a rapidly changing world. Apple drives environmental responsibility in product design and manufacturing. In 2018, we reached our goal of powering all of Apples global facilities with 100% renewable energy. Were committed to one day making our products from only recycled or renewable materials. In a major step toward that goal, in October 2018 we introduced Apples first product made with a 100% recycled aluminum enclosure. The strength of our innovation depends on a diverse workforce that is a reflection of the world around us. Were deeply committed to hiring and promoting more inclusively, fostering a culture that allows people to do their lifes best work, compensating equally, and working to create more access and opportunities. As we continue to grow, were striving to better represent the communities were a part of and to help break down historical barriers in the tech industry. Apple believes privacy is a fundamental human right. Every Apple product is designed from the ground up to protect your privacy and security. Great experiences do not have to come at the expense of your privacy and security. Instead, they can support them. In November 2018 we launched our Privacy Portal worldwide so that all our users can manage their data. Apple educates and empowers the people in our supply chain and helps preserve our environments most precious resources. We set an ambitious goal of providing health education to over one million supply chain employees by 2020. Through our partnerships with suppliers, all final assembly facilities for iPhone are now zero waste certified worldwide. This section describes Apples corporate governance framework and the role and structure of our Board. Apples Board oversees the CEO and other senior management in the competent and ethical operation of Apple on a day-to-day basis and assures that the long-term interests of shareholders are being served. To satisfy the Boards duties, directors are expected to take a proactive, focused approach to their positions to ensure that Apple is committed to business success through the maintenance of high standards of responsibility and ethics. The Board believes that Apples governance structure fosters principled actions, informed and effective decision-making, and appropriate monitoring of compliance and performance. Apples key governance documents, including our Corporate Governance Guidelines, are available at https://investor.apple.com/investor-relations/leadership-and-governance/default.aspx. The Board met four times during 2018, and each member of the Board attended or participated in 75% or more of the aggregate of (i) the total number of meetings of the Board held during 2018, and (ii) the total number of meetings held by each committee of the Board on which such member served during 2018. The Board has a standing Audit and Finance Committee (the Audit Committee), Compensation Committee, and Nominating and Corporate Governance Committee (the Nominating Committee). The Board has determined that the Chairs of each committee and all committee members are independent under applicable rules of The Nasdaq Stock Market LLC (Nasdaq), the New York Stock Exchange LLC (NYSE), and the Securities and Exchange Commission (SEC) for committee memberships. Each committee operates under a written charter adopted by the Board, which is available at https://investor.apple.com/investor-relations/leadership-and-governance/default.aspx. The auditing, accounting, and financial reporting process generally. The Audit Committee appoints Apples independent registered public accounting firm and reviews the services performed by such firm. The Audit Committee met eight times during 2018.
set forth in its charter. The Compensation Committees authority to grant equity awards or to take any other action with respect to equity awards (other than the performance of ministerial duties) may not be delegated to Apples management or others. For a description of the Compensation Committees processes and procedures, including the roles of its independent compensation consultant and the CEO in support of the Compensation Committees decision-making process, see the section entitled Compensation Discussion and Analysis below. The Compensation Committee met five times during 2018. The Nominating Committees duties and responsibilities include assisting the Board in identifying qualified individuals to become directors; making recommendations to the Board concerning the size, structure, and composition of the Board and its committees; and overseeing and making recommendations regarding corporate governance matters, including Apples Corporate Governance Guidelines. The Nominating Committee also oversees the annual Board performance evaluation process, including the format of the annual Board self-evaluation. The Nominating Committee met four times during 2018. In accordance with its charter and Apples Corporate Governance Guidelines, the Nominating Committee has evaluated and recommended to the full Board each of the nominees named in this Proxy Statement for election to the Board. The Board conducts an annual self-evaluation that is intended to determine whether the Board, its committees, and each member of the Board are functioning effectively, and to provide them with an opportunity to reflect upon and improve processes and effectiveness. Dr. Levinson, the independent Chairman of the Board, leads the evaluation process. Dr. Levinson conducts one-on-one discussions with each director to obtain their assessment of the effectiveness and performance of the Board, its committees, and each member of the Board. Board members are also invited to discuss the performance of Dr. Levinson directly with the Chair of the Nominating Committee. A summary of the results is presented to the Nominating Committee on a no-names basis identifying any themes or issues that have emerged. The results are then reported to the Board, which considers the results and ways in which Board processes and effectiveness may be enhanced. In addition, each committee conducts its own annual self-evaluation and reports the results to the Board. Each committees report includes an assessment of the committees compliance with Apples Corporate Governance Guidelines and the committees charter, as well as ways in which committee processes and effectiveness may be enhanced. allows the CEO to focus his time and energy on operating and managing Apple, while leveraging the Chairmans experience and perspectives. The Board periodically reviews its leadership structure to determine whether it continues to best serve Apple and its shareholders. The Board believes that evaluating the executive teams management of the various risks confronting Apple is one of its most important areas of oversight. In carrying out this critical responsibility, the Board has designated the Audit Committee with primary responsibility for overseeing enterprise risk management. In accordance with this responsibility, the Audit Committee monitors Apples significant business risks, including financial; operational; privacy; data security; business continuity; legal; regulatory; and reputational risks. The Audit Committee reviews the steps management has taken to monitor and mitigate these risks. With respect to privacy and data security, the Audit Committee reviews reports from Apples General Counsel and the heads of information security, business conduct and compliance, business assurance, and internal audit. These reports include updates on risk management, Apples privacy program, and relevant legislative, regulatory, and technical developments. The Audit Committee is assisted in its risk oversight duties by a Risk Oversight Committee consisting of key members of management, including, among others, Apples Chief Financial Officer, General Counsel, and head of business assurance. The Risk Oversight Committee reports regularly to the Audit Committee. Senior members of management responsible for risk management across a wide range of areas and functions also report regularly to the Audit Committee. While the Audit Committee has primary responsibility for overseeing enterprise risk management and reports regularly to the Board, the other Board committees also consider risks within their areas of responsibility and apprise the Board of significant risks and managements response to those risks. For example, the Nominating Committee reviews legal and regulatory compliance risks as they relate to Apples corporate governance structure and processes, and the Compensation Committee reviews risks related to compensation matters. While the Board and its committees oversee risk management strategy, management is responsible for implementing and supervising day-to-day risk management processes and reporting to the Board and its committees. In establishing and reviewing Apples executive compensation program, the Compensation Committee considers whether the program encourages unnecessary or excessive risk-taking and has concluded that it does not. Base salaries are fixed in amount and thus do not encourage risk-taking. Annual cash incentives are capped and payouts are formulaic and tied to specific company financial performance measures. A substantial portion of each executive officers compensation is in the form of time-based and performance-based equity awards that vest over several years and help align their interests with those of Apples shareholders in creating long-term shareholder value. The Compensation Committee believes that these awards do not encourage unnecessary or excessive risk-taking because the ultimate value of the awards is tied to Apples share price performance over several years and because awards are subject to regular vesting schedules. The Compensation Committee has also reviewed Apples compensation programs for employees generally and has concluded that these programs do not create risks that are reasonably likely to have a material adverse effect on Apple. The Compensation Committee believes that Apples cash bonus programs and long-term equity awards provide an effective and appropriate mix of incentives to help ensure performance is focused on long-term shareholder value creation and do not encourage short-term risk taking at the expense of long-term results. The Board has determined that each member of the Audit Committee qualifies as an audit committee financial expert as defined under applicable SEC rules and also meets the additional criteria for independence of audit committee members set forth in Rule 10A-3(b)(1) under the Securities Exchange Act of 1934, as amended (the Exchange Act). Apple has a code of ethics, Business Conduct: The way we do business worldwide, that applies to all employees, including Apples principal executive officer, principal financial officer, and principal accounting officer, to the Board, and to independent contractors, consultants, and others who do business with Apple. The code is available at investor.apple.com/corporate-governance.cfm. Apple intends to disclose any changes in this code or waivers from this code that apply to Apples principal executive officer, principal financial officer, or principal accounting officer by posting such information to our website or by filing with the SEC a Current Report on Form 8-K, in each case if such disclosure is required by SEC or Nasdaq rules. Any other information regarding the transaction or the related person in the context of the proposed transaction that would be material to investors in light of the circumstances of the particular transaction. Any transaction where the related persons interest arises solely from the ownership of Apples common stock and all holders of Apples common stock received the same benefit on a pro-rata basis, such as dividends. A summary of new transactions covered by the standing pre-approvals, or approved or ratified by the Chair of the Audit Committee, if any, is provided to the Audit Committee for its review at each regularly scheduled Audit Committee meeting. Mr. Iger is Chairman and Chief Executive Officer of The Walt Disney Company. In the ordinary course of business, Apple enters into arms-length commercial dealings with The Walt Disney Company, including sales arrangements, digital services content licensing agreements, and similar arrangements. Apple does not believe that Mr. Iger has a material direct or indirect interest in any of such commercial dealings. The Board has determined that all Board members, other than Mr. Cook, are independent under applicable Nasdaq, NYSE, and SEC rules. In making these determinations, the Board considered the types and amounts of the commercial dealings between Apple and the companies and organizations with which the directors are affiliated. Apple expects all of its directors to attend the Annual Meeting. All directors attended the 2018 annual meeting of shareholders. officers served as a director or a member of a compensation committee (or other committee serving an equivalent function) of any other entity, an executive officer of which served as a director of Apple or member of the Compensation Committee during 2018. Any matter intended for the Board, or for any individual member of the Board, should be directed to Apples Secretary at One Apple Park Way, MS: 169-5GC, Cupertino, California 95014, with a request to forward the communication to the intended recipient. In general, any shareholder communication delivered to Apple for forwarding to Board members will be forwarded in accordance with the shareholders instructions. However, Apple reserves the right not to forward to Board members any abusive, threatening, or otherwise inappropriate materials. Information regarding the submission of comments or complaints relating to Apples accounting, internal accounting controls, or auditing matters is available under our Policy on Reporting Questionable Accounting or Auditing Matters at investor.apple.com/corporate-governance.cfm. This section describes the experience and qualifications of our Board members and how they are compensated. Apples Board consists of a highly qualified, diverse group of leaders in their respective fields. Most of our directors have senior leadership experience at major domestic and multinational companies. In these positions, they have gained significant and diverse management experience, including strategic and financial planning, public company financial reporting, compliance, risk management, and leadership development. They also have experience serving as executive officers, or on boards of directors and board committees of other public companies, and have an understanding of corporate governance practices and trends. In addition, many of our directors have experience as directors or trustees of significant academic, research, nonprofit, and philanthropic institutions, and bring unique perspectives to the Board. The Board and the Nominating Committee believe the skills, qualities, attributes, and experience of our directors provide Apple with business acumen and a diverse range of perspectives to engage each other and management to effectively address Apples evolving needs and represent the best interests of Apples shareholders. The Nominating Committee considers candidates for director who are recommended by its members, by other Board members, by shareholders, and by management, as well as those identified by third-party search firms retained to assist in identifying and evaluating possible candidates. 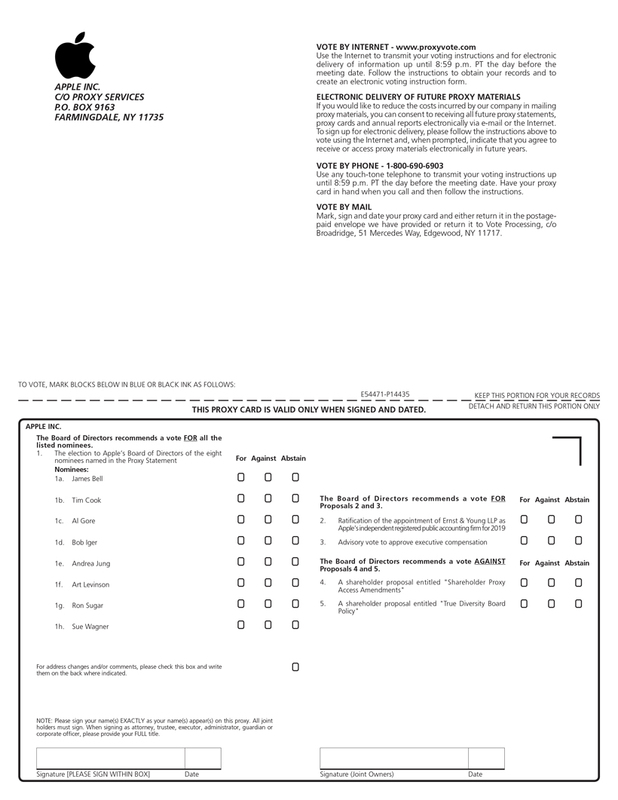 In evaluating potential nominees to the Board, the Nominating Committee considers, among other things: independence; character; ability to exercise sound judgment; diversity; age; demonstrated leadership; and relevant skills and experience, including financial literacy, antitrust compliance, and other experience in the context of the needs of the Board. The Nominating Committee is committed to actively seeking out highly qualified women and individuals from minority groups to include in the pool from which Board nominees are chosen. The Nominating Committee evaluates candidates recommended by shareholders using the same criteria as for other candidates recommended by its members, other members of the Board, or other persons. In addition, our bylaws provide that a shareholder, or a group of up to 20 shareholders, owning at least 3% of our outstanding shares continuously for at least three years, may nominate director nominees constituting up to 20% of Apples Board that would be included in our proxy statement pursuant to our proxy access provisions. Nominating shareholders and nominees must satisfy the requirements set forth in our bylaws, which can be found at investor.apple.com/corporate-governance.cfm. The following biographies describe the skills, qualities, attributes, and experience of the nominees that led the Board and the Nominating Committee to determine that it is appropriate to nominate these directors for election to the Board. Each of the eight nominees currently serves on the Board. Art Levinson, 68, has served as the Chief Executive Officer of Calico, a company focused on health, aging, and well-being, since September 2013. Dr. Levinson previously served as Chief Executive Officer of Genentech, Inc., a medical drug developer, from July 1995 to April 2009, and served as Genentechs Chairman from September 1999 to September 2014. Among other qualifications, Dr. Levinson brings to the Board executive leadership experience, including his service as a chairman and chief executive officer of a large international public company, along with extensive financial expertise and brand marketing experience. 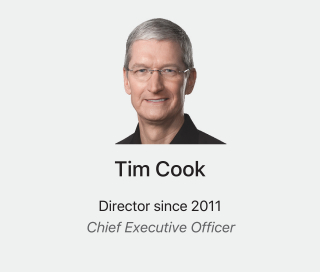 Tim Cook, 58, has been Apples Chief Executive Officer since August 2011 and was previously Apples Chief Operating Officer since October 2005. Mr. Cook joined Apple in March 1998 and served as Executive Vice President, Worldwide Sales and Operations from 2002 to 2005. From 2000 to 2002, Mr. Cook served as Senior Vice President, Worldwide Operations, Sales, Service and Support. From 1998 to 2000, Mr. Cook served as Senior Vice President, Worldwide Operations. Among other qualifications, Mr. Cook brings to the Board extensive executive leadership experience in the technology industry, including the management of worldwide operations, sales, service, and support. Board of Directors, The National Football Foundation & College Hall of Fame, Inc.
James Bell, 70, is the retired Executive Vice President, Corporate President and Chief Financial Officer of The Boeing Company, an aerospace company. 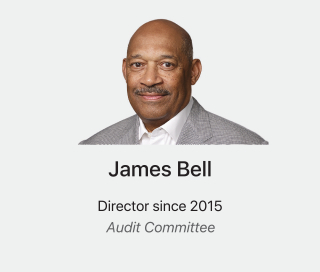 Mr. Bell served in this role from 2008 to 2012, having previously served as Executive Vice President, Finance and Chief Financial Officer from 2003 to 2008, and as Senior Vice President of Finance and Corporate Controller from 2000 to 2003. From 1992 to 2000, Mr. Bell held a series of positions with increasing responsibility at Boeing. Among other qualifications, Mr. Bell brings to the Board financial and accounting expertise as a former chief financial officer of a large international public company, experience in strategic planning and leadership of complex organizations, and a global business perspective from his service on other boards. Al Gore, 70, has served as Chairman of Generation Investment Management, an investment management firm, since 2004, and as a partner of Kleiner Perkins Caufield & Byers, a venture capital firm, since 2007. 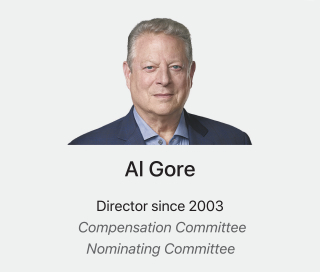 Mr. Gore is also Chairman of The Climate Reality Project. Mr. Gore was elected to the U.S. House of Representatives four times, to the U.S. Senate two times, and served two terms as Vice President of the United States. Among other qualifications, Mr. Gore brings to the Board executive leadership experience, a valuable and different perspective due to his extensive background in digital communication and technology policy, politics, and environmental rights, along with experience in asset management and venture capital. Bob Iger, 68, has served as Chairman and Chief Executive Officer of The Walt Disney Company, a diversified media company, since March 2012. Prior to that time, he served as President and Chief Executive Officer of Disney since October 2005, having previously served as President and Chief Operating Officer since January 2000 and as President of Walt Disney International and Chairman of the ABC Group from 1999 to 2000. From 1974 to 1998, Mr. Iger held a series of positions with increasing responsibility at ABC, Inc. and its predecessor, Capital Cities/ABC, Inc. 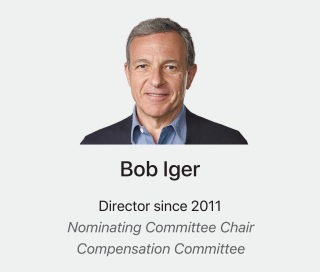 Among other qualifications, Mr. Iger brings to the Board executive leadership experience, including his service as a chairman and chief executive officer of a large international public company, along with extensive financial expertise and experience in international business and brand marketing. Andrea Jung, 60, has served as the President and Chief Executive Officer of Grameen America LLC, a nonprofit microfinance organization, since April 2014, where she also serves on the Board of Directors. Ms. Jung previously served as Executive Chairman of Avon Products, Inc., a personal care products company, from April 2012 to December 2012, and as Chairman of the Board of Directors of Avon from September 2001 to April 2012. Ms. Jung served as Chief Executive Officer of Avon from November 1999 to April 2012, and served as a member of the Board of Directors of Avon from January 1998 to December 2012. Among other qualifications, Ms. Jung brings to the Board executive leadership experience, including her service as a chairman and chief executive officer of a large international public company, along with extensive brand marketing and consumer products experience, and a global business perspective from her service on other boards. Unilever PLC and Unilever N.V.
Ron Sugar, 70, is the retired Chairman of the Board and Chief Executive Officer of Northrop Grumman Corporation, a global security company. Dr. Sugar served in this role from 2003 to 2010 and served as President and Chief Operating Officer from 2001 to 2003. Previous to Northrop Grumman, he held executive positions at Litton Industries and TRW Inc., where he served as Chief Financial Officer. Dr. Sugar is a senior advisor to various businesses and organizations, including Ares Management, LLC, Bain & Company, Temasek Americas Advisory Panel, the G100 Network and the World 50. Among other qualifications, Dr. Sugar brings to the Board executive leadership experience as a chairman and chief executive officer of a large international public company, financial expertise as a former chief financial officer, understanding of advanced technology, and a global business perspective from his service on other boards. 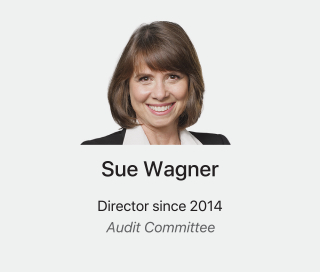 Sue Wagner, 57, is a co-founder of BlackRock, Inc., an asset management company. Ms. Wagner served as BlackRocks Vice Chairman from January 2006 to July 2012, and also served as a member of BlackRocks Global Executive Committee and Global Operating Committee. During her tenure at BlackRock, Ms. Wagner served as BlackRocks Chief Operating Officer and Head of Corporate Strategy, and led the alternative investments and international client businesses. Among other qualifications, Ms. Wagner brings to the Board operational experience, including her service as chief operating officer of a large multinational public company, along with extensive financial expertise and experience in the financial services industry, and a global business perspective from her service on other boards. Board of Directors, Color Genomics, Inc.
Members of the Board who are not Apple employees (Non-Employee Directors) receive compensation for their service. Mr. Cook, our CEO, does not receive any compensation for his service as a member of the Board. The Compensation Committee annually reviews the total compensation of our Non-Employee Directors and each element of our Non-Employee Director compensation program. As part of this process, the Compensation Committee evaluates market data provided by its independent compensation consulting firm, Pay Governance LLC, and makes a recommendation to the Board. The Board determines the form and amount of director compensation after reviewing the Compensation Committees recommendation. The Apple Inc. Non-Employee Director Stock Plan provides for an annual limit of $1.5 million for all compensation paid to a Non-Employee Director. Cash Retainers. Non-Employee Directors receive an annual cash retainer of $100,000. In 2018, the Chairman of the Board, Dr. Levinson, received an additional cash retainer of $200,000; the Chair of the Audit Committee, Dr. Sugar, received an additional cash retainer of $35,000; the Chair of the Compensation Committee, Ms. Jung, received an additional cash retainer of $30,000; and the Chair of the Nominating Committee, Mr. Iger, received an additional cash retainer of $25,000. All retainers are paid in quarterly installments. Equity-Based Awards. A substantial portion of each Non-Employee Directors annual retainer is in the form of equity. Under the Apple Inc. Non-Employee Director Stock Plan, Non-Employee Directors are granted restricted stock units (RSUs) on the date of each annual meeting of shareholders (each, an Annual Director Award). All Annual Director Awards vest on February 1 of the following year, subject to continued service on the Board through the vesting date. For 2018, the number of RSUs subject to each Annual Director Award was determined by dividing $250,000 by the per share closing price of Apples common stock on the date of grant. A Non-Employee Director who is newly appointed to the Board other than in connection with an annual meeting of shareholders will receive a grant of RSUs upon appointment (an Initial Director Award), except that a Non-Employee Director who joins the Board on or after February 1 of a particular year and prior to the annual meeting for that year, or a director who was an employee of Apple immediately prior to first becoming a Non-Employee Director, will not receive an Initial Director Award. The number of RSUs subject to each Initial Director Award is determined in the same manner as described above for Annual Director Awards, but the award is pro-rated based on the portion of the year that has passed since the last annual meeting. Initial Director Awards are scheduled to vest on the next February 1 following the award. Non-Employee Directors do not have the right to vote or dispose of the RSUs subject to these awards. If Apple pays an ordinary cash dividend on its common stock, each RSU award granted under the Apple Inc. Non-Employee Director Stock Plan will be credited with an amount equal to the per share cash dividend paid by Apple, multiplied by the total number of RSUs subject to the award that are outstanding immediately prior to the record date for such dividend. The amounts that are credited to each award are referred to as dividend equivalents. Any dividend equivalents credited to an award granted under the Apple Inc. Non-Employee Director Stock Plan will be subject to the same vesting, payment, and other terms and conditions as the RSUs to which the dividend equivalents relate. The crediting of dividend equivalents is meant to treat the RSU award holders consistently with shareholders. Equipment Program and Charitable Gift Matching. Apple has an equipment program for the Board under which each Non-Employee Director is eligible to receive, upon request and free of charge, one of each new product introduced by Apple, and is eligible to purchase additional equipment at a discount. Additionally, each Non-Employee Director is eligible to participate in Apples charitable matching gifts program to the same extent as all Apple employees. For calendar 2018, the maximum match amount was $20,000. Non-Employee Directors do not receive any other compensation for serving on any committee or attending Board or committee meetings. Stock Ownership Guidelines. Apple has stock ownership guidelines for our CEO, executive officers, and Non-Employee Directors. Under the guidelines, Non-Employee Directors are expected to own shares of Apples common stock that have a value equal to five times their annual cash retainer for serving as a director. Shares may be owned directly by the individual, owned jointly with, or separately by, the individuals spouse, or held in trust for the benefit of the individual, the individuals spouse or the individuals children. Each Non-Employee Director currently satisfies the stock ownership guidelines. The following table shows information regarding the compensation earned or paid during 2018 to Non-Employee Directors who served on the Board during the year. The compensation paid to Mr. Cook is shown under Executive Compensation in the table entitled Summary Compensation Table2018, 2017, and 2016 and the related tables. Mr. Cook does not receive any compensation for his service as a member of the Board. In accordance with SEC rules, the amounts shown reflect the aggregate grant date fair value of stock awards granted to Non-Employee Directors during 2018, computed in accordance with Financial Accounting Standards Board Accounting Standards Codification Topic 718 (FASB ASC 718). The grant date fair value for RSUs is measured based on the closing price of Apples common stock on the date of grant. See Note 1Summary of Significant Accounting Policies found in Part II, Item 8, Financial Statements and Supplementary Data in the Notes to Consolidated Financial Statements in the Annual Report on Form 10-K for the year ended September 29, 2018. Each Non-Employee Director received an automatic Annual Director Award of 1,521 RSUs on February 13, 2018, and the grant date fair value for each RSU was $164.34. As of September 29, 2018, each Non-Employee Director held 1,521 RSUs. In addition, Mr. Gore held outstanding and unexercised options to purchase 67,889 shares, Ms. Jung held outstanding and unexercised options to purchase 9,590 shares, and Dr. Levinson held outstanding and unexercised options to purchase 107,394 shares. The amounts shown reflect one or more products received under Apples Board of Directors Equipment Program. The amounts also include matching charitable contributions under Apples matching gifts program of $4,500 for Mr. Bell, $20,000 for Ms. Jung, and $20,000 for Dr. Sugar. This section includes biographical information for Apples executive officers, other than Mr. Cook. Kate, 54, oversees all legal matters, including corporate governance, intellectual property, litigation, compliance, global security, and privacy. Kate joined Apple as General Counsel in November 2017. 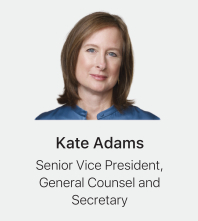 Prior to joining Apple, Kate served as General Counsel of Honeywell International Inc., a diversified technology and manufacturing company, from September 2008. Prior to joining Honeywell in 2003, Kate was a partner at the law firm of Sidley Austin LLP. Angela, 58, oversees the strategy, real estate and development, and operations of Apples physical stores, online store, and contact centers. Angela joined Apple and assumed her current position in May 2014. Prior to joining Apple, Angela served as director and Chief Executive Officer of Burberry plc, a luxury fashion company, from July 2006. Angela also previously served as Executive Vice President at Liz Claiborne Inc., and as President of Donna Karan International. Angela has served as a director of Ralph Lauren Corporation since August 2018. Luca, 55, oversees Apples accounting, business support, financial planning and analysis, treasury, M&A, investor relations, internal audit, and tax functions. 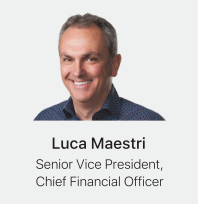 Luca joined Apple in March 2013 and assumed his current position in May 2014, after previously serving as Apples Vice President and Corporate Controller. Prior to joining Apple, Luca was Executive Vice President, Chief Financial Officer of Xerox Corporation, a business services and technology company, from February 2011 to February 2013; Chief Financial Officer at Nokia Siemens Networks; and had a 20-year career with General Motors Corporation, including serving as Chief Financial Officer of GM Europe and GM Brazil. Jeff, 55, oversees Apples entire supply chain, service and support, and social responsibility initiatives for Apples supply chain. He also oversees the development of Apple Watch and drives the companys health initiatives. Jeff joined Apple in June 1998 and assumed his current position in December 2015. 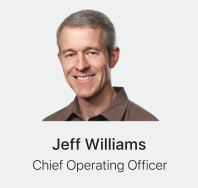 Jeffs previous positions with Apple include Senior Vice President, Operations; Head of Worldwide Procurement; and Vice President of Operations. Prior to joining Apple, Jeff worked in a number of operations and engineering roles at IBM from 1985 to 1998. This section describes the compensation program for our named executive officers and includes the required executive compensation tables. The Compensation Committee has reviewed and discussed with management the disclosures contained in the following Compensation Discussion and Analysis. Based on this review and discussion, the Compensation Committee recommended to the Board that the section entitled Compensation Discussion and Analysis be included in this Proxy Statement for the Annual Meeting. Apple delivered a year of extraordinary performance in 2018, as we shipped our 2 billionth iOS device, celebrated the 10th anniversary of the App Store, and achieved the strongest net sales in Apples history, among many other accomplishments and milestones. Net sales grew $36.4 billion to $265.6 billion, and operating income grew $9.6 billion to $70.9 billion, representing 16% year-over-year growth for each of these key performance measures. We also returned almost $90 billion to our investors through dividends and share repurchases. We believe the compensation paid to our named executive officers for 2018 appropriately reflects and rewards their contribution to our performance. Team-Based Approach. We apply a team-based approach to the compensation of our named executive officers with internal pay equity as a primary consideration. Performance Expectations. We establish clear, quantitative performance goals focused on Apples overall success rather than on objectives specific to each named executive officers areas of responsibility. Emphasis on Long-Term Equity Incentives. We emphasize long-term performance, retention, and alignment between the interests of our named executive officers and shareholders by significantly weighting their compensation toward long-term equity awards. Executive Compensation Policies and Practices. We are committed to sound executive compensation policies and practices, as highlighted in the following table. The Compensation Committee has directly retained an independent compensation consultant that performs no services for Apple other than services for the Compensation Committee. The Compensation Committee conducts an annual risk assessment of our compensation program. We prohibit short sales, transactions in derivatives of Apple securities, including hedging transactions, and pledging of shares by our named executive officers. We have robust stock ownership guidelines for our named executive officers. Our RSU agreements have a recoupment provision requiring repayment to Apple of any shares or other amounts that may be paid in respect of RSUs in the event of certain acts of misconduct. We apply the same vesting restrictions and performance conditions on dividend equivalents as on the underlying RSUs. We employ our named executive officers at will. We do not provide pensions or supplemental executive retirement, health, or insurance benefits. We do not offer change of control payments or gross-ups of related excise taxes. We do not include retirement vesting provisions in equity awards. We do not have severance arrangements with any of our named executive officers. We do not allow repricing of stock options without shareholder approval. The Compensation Committee, consisting entirely of independent directors, reviews and approves the compensation of Apples named executive officers and acts as the administering committee for Apples employee equity compensation plans. Each year, the Compensation Committee conducts an evaluation of Apples executive compensation program to determine if any changes would be appropriate. In making this determination, the Compensation Committee may consult with its independent compensation consultant and management, as described below; however, the Compensation Committee uses its own judgment in making final decisions regarding the compensation paid to our named executive officers. The Role of the Compensation Consultant. The Compensation Committee selects and retains the services of its own independent compensation consultant and annually reviews the performance of the consultant. As part of the review process, the Compensation Committee considers the independence of the consultant in accordance with SEC and Nasdaq rules. Since 2014, the Compensation Committee has engaged the services of Pay Governance, an independent compensation consulting firm. During 2018, Pay Governance provided no services to Apple other than services for the Compensation Committee, and worked with Apples management, as directed by the Compensation Committee, only on matters for which the Compensation Committee is responsible. At the Compensation Committees request, Pay Governance regularly attends Compensation Committee meetings. Pay Governance also communicates with the Chair of the Compensation Committee outside committee meetings regarding matters related to the Compensation Committees responsibilities. In 2018, the Compensation Committee generally sought input from Pay Governance on a range of external market factors, including evolving compensation trends, appropriate market reference points, and market compensation data. Pay Governance also provided general observations about Apples compensation programs and about managements recommendations regarding the amount and form of compensation for our named executive officers. The Role of the Chief Executive Officer. At the Compensation Committees request, Mr. Cook provides input regarding the performance and appropriate compensation of the other named executive officers. The Compensation Committee considers Mr. Cooks evaluation and his direct knowledge of each named executive officers performance and contributions when making compensation decisions. Mr. Cook is not present during voting or deliberations by the Compensation Committee regarding his own compensation. The Role of Peer Companies and Benchmarking. The Compensation Committee reviews peer group composition each year. With the assistance of Pay Governance, the Compensation Committee identified groups of companies to serve as market reference points for compensation comparison purposes for 2018. A primary peer group was developed for reference consisting of U.S.-based, stand-alone, publicly traded companies in the technology, media, and internet services industries that, in the Compensation Committees view, compete with Apple for talent. The threshold revenue and market capitalization requirements for a company to be considered for the primary peer group for 2018 were $15 billion and $35 billion, respectively. A secondary peer group of premier companies that have iconic brands or are industry or category leaders, rely on significant research and development and innovation for growth, and require highly-skilled human capital was also developed as an additional reference set for the Compensation Committee. The chart below lists the companies in the primary and secondary peer groups. References in this Compensation Discussion and Analysis to peer companies include both the primary and the secondary peer group companies. The Compensation Committees executive compensation determinations are subjective and the result of the Compensation Committees business judgment, which is informed by the experience of the members of the Compensation Committee as well as input from, and peer group data provided by, the Compensation Committees independent compensation consultant. The Compensation Committee reviews compensation practices and program design at peer companies to inform its decision-making process so it can set total compensation levels that it believes are commensurate with the relative size, scope, and performance of Apple. The Compensation Committee, however, does not set compensation components to meet specific benchmarks as compared to peer companies, such as targeting salaries at a specific market percentile. Shareholder Feedback. We value the feedback provided by our shareholders and have discussions with many of them regarding various corporate governance topics, including executive compensation. Shareholders are also provided the opportunity to cast an annual advisory vote on the compensation of our named executive officers. At Apples 2018 annual meeting of shareholders, shareholders indicated their overwhelming support for the compensation of our named executive officers, with 95% supporting our say-on-pay proposal for the third consecutive year. The Compensation Committee considered this result and shareholder feedback and approved an executive compensation program for 2019 that is similar to the 2018 program. The Compensation Committee will continue to consider shareholder feedback and the results of say-on-pay votes when making future compensation decisions. Our executive compensation program is designed to motivate and reward exceptional performance in a straightforward and effective way, while also recognizing the remarkable size, scope, and success of Apples business. The compensation of our named executive officers has three primary components: annual base salary, annual cash incentive, and long-term equity awards. Annual Base Salary. Base salary is a customary, fixed element of compensation intended to attract and retain executives. When setting the annual base salaries of our named executive officers, the Compensation Committee considers market data provided by its independent compensation consultant, internal pay equity, and Apples financial results and size relative to peer companies. The annual base salaries of our named executive officers were not changed for 2018. Mr. Cooks annual base salary was $3 million, and each of our other named executive officers annual base salary was $1 million. Annual Cash Incentive. Our annual cash incentive program is a variable, at-risk component of our named executive officers compensation that is aligned with Apples annual financial results. Net sales and operating income, as determined in accordance with generally accepted accounting principles, are used as the performance measures for the annual cash incentive program because they reflect commonly recognized measures of overall company performance and profitability and are drivers of shareholder value creation. The annual cash incentive program provides payout opportunities based on the achievement of pre-determined financial goals that require our named executive officers to meet high standards of performance at threshold, target, and maximum levels. Actual annual cash incentive payouts are determined based on an equal weighting for the net sales and operating income measures and are linearly interpolated for achievement between the applicable threshold, target, and maximum goals, as approved by the Compensation Committee. There is no payout for a particular performance measure unless the threshold goal is achieved with respect to that measure, and the maximum total payout is capped at 400% of annual base salary if performance exceeds both of the maximum performance goals. The Compensation Committee may, in its discretion, reduce the actual payout of any individuals annual cash incentive based on Apples performance and the Compensation Committees subjective assessment of the named executive officers overall performance. The Compensation Committee established goals under the 2018 annual cash incentive program taking into consideration Apples 2017 financial results and 2018 expectations, macroeconomic factors, and alignment between payout opportunities and performance levels. 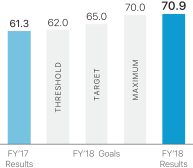 For both net sales and operating income, the 2018 performance goals were set higher than 2017 results, as shown below. At the threshold performance level, the payout opportunity was 50% of annual base salary for each performance measure; at the target performance level, the payout opportunity was 100% of annual base salary for each performance measure; and at the maximum performance level, the payout opportunity was capped at 200% of annual base salary for each performance measure. 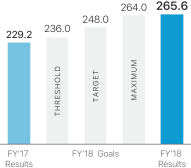 For 2018, as shown in the chart above, we achieved net sales of $265.6 billion and operating income of $70.9 billion, each representing a year-over-year increase of 16%, and exceeding the 2018 maximum annual cash incentive program goals for both of those performance measures. The Compensation Committee determined that no downward adjustments to the payouts would be made based on Apples 2018 performance and the individual contributions of our named executive officers and approved the maximum total payout at 400% of annual base salary. The equity component of our named executive officers compensation emphasizes long-term shareholder value creation through performance- and time-based RSU awards. Performance-Based RSUs. RSU awards with performance-based vesting are a substantial, at-risk component of our named executive officers compensation that is tied to Apples long-term performance. The number of performance-based RSUs that vest depends on Apples total shareholder return relative to the other companies in the S&P 500 (Relative TSR) for the performance period. The Compensation Committee chose Relative TSR as a straightforward and objective metric to evaluate our performance against the performance of other companies and to align the interests of our named executive officers with the interests of our shareholders in creating long-term value. We measure Relative TSR for the applicable performance period based on the change in each companys stock price during that period, taking into account any dividends paid during that period, which are assumed to be reinvested in the stock. A 20-trading-day averaging period is used to determine the beginning and ending stock price values used to calculate the total shareholder return of Apple and the other companies in the S&P 500. This averaging period mitigates the impact on the long-term Relative TSR results of one-day or short-term stock price fluctuations at the beginning or end of the performance period. The change in value from the beginning to the end of the period is divided by the beginning value to determine total shareholder return. Apples total shareholder return is compared to the total shareholder return of other S&P 500 companies, ranked by percentile, to determine the number of performance-based RSUs that vest for each performance period. Time-Based RSUs. RSU awards with time-based vesting align the interests of our named executive officers with the interests of our shareholders by promoting the stability and retention of a high-performing executive team over the longer term. Vesting schedules for time-based awards generally require continuous service over multiple years, as described below. Mr. Cook last received an equity award when he was promoted to CEO in 2011 (the 2011 RSU Award). At Mr. Cooks request, the 2011 RSU Award was significantly modified in 2013 to put a portion of the award at risk through a performance condition based on Apples Relative TSR performance. The performance condition requires Apple to outperform two-thirds of the companies that were included in the S&P 500 for the entirety of each performance period in order for 100% of the performance-based RSUs allocated to that period to vest. The 2011 RSU Award has only downside risk to Mr. Cook. It does not contain any upside vesting opportunity above 100%, and there is no interpolation for results between the Relative TSR percentile levels set forth below. For the three-year performance period from August 25, 2015 through August 24, 2018, 280,000 performance-based RSUs were subject to the Relative TSR performance condition. Apples Relative TSR for this performance period was at the 88th percentile of the companies that were included in the S&P 500 for the entire performance period. As a result, all of the 280,000 performance-based RSUs vested on August 24, 2018. Apples total shareholder return during this 3-year performance period was 89.94%. In 2018, the Compensation Committee granted long-term equity awards to Ms. Adams, Ms. Ahrendts, Mr. Maestri, and Mr. Williams consisting of both performance- and time-based RSUs (the 2018 RSU Awards). Performance-Based RSUs. The performance-based RSUs awarded to Ms. Ahrendts, Mr. Maestri, and Mr. Williams were granted on October 1, 2017, the first day of the three-fiscal-year performance period applicable to the awards. The performance-based RSUs awarded to Ms. Adams were granted on November 13, 2017 in connection with her hiring. The performance-based component of the 2018 RSU Awards granted to Ms. Ahrendts, Mr. Maestri, and Mr. Williams has a three-fiscal-year performance period from the beginning of 2018 through the end of 2020. The performance-based component of the 2018 RSU Awards granted to Ms. Adams has a performance period from her first day of employment, November 13, 2017, through the end of 2020. For each performance period, this vesting schedule requires Relative TSR performance at the 25th percentile to vest in the threshold number of performance-based RSUs, Relative TSR performance above the median at the 55th percentile to vest in the target number of performance-based RSUs, and Relative TSR performance at or above the 85th percentile in order to vest in the maximum 200% of the target number of performance-based RSUs. No performance-based RSUs vest if Apples Relative TSR performance is below the 25th percentile. In addition, if Apples total shareholder return for the performance period is negative, the number of performance-based RSUs that vests is capped at 100% of the target number of performance-based RSUs regardless of our percentile ranking. If Apples Relative TSR percentile ranking is above the 25th percentile and between the other levels shown in the table above, the portion of the performance-based RSUs that vests is linearly interpolated between the two nearest vesting percentages. 2018 Performance-Based RSU Payout Results. During 2018, Ms. Ahrendts, Mr. Maestri, and Mr. Williams each vested in performance-based RSUs that were granted on October 17, 2014. For the three-fiscal-year performance period from the beginning of 2015 through the end of 2017, Ms. Ahrendts, Mr. Maestri, and Mr. Williams each vested in 125,494 performance-based RSUs, representing 183% of the target number of performance-based RSUs, based on Apples Relative TSR at the 80th percentile of the companies that were included in the S&P 500 for the period. Apples total shareholder return during this 3-year performance period was 65.53%. The time-based component of the 2018 RSU Awards granted to Ms. Ahrendts, Mr. Maestri, and Mr. Williams vests in three equal annual installments commencing on April 1, 2020 (approximately two and one-half years following the grant date), subject to continued employment through each vesting date. This schedule means that, to receive the full benefit of the time-based RSUs, the recipient must perform approximately four and one-half years of continuous service following the grant date. The April vesting dates for the time-based RSUs were selected to balance the October vesting of the performance-based RSUs and provide regular vesting intervals. The time-based component of the 2018 RSU Awards granted to Ms. Adams vests in equal installments on May 13, 2018; November 13, 2018; November 13, 2019; and November 13, 2020, subject to her continued employment through each vesting date. The vesting schedule for the time-based component of Ms. Adams 2018 RSU Award was determined to approximate the expected value and timing of compensation Ms. Adams forfeited at her prior employer when she joined Apple. At Mr. Cooks request, none of his RSUs participate in dividend equivalents. All other RSUs granted to employees have dividend equivalent rights, which entitle RSU holders to the same dividend value per share as our shareholders. Dividend equivalents are subject to the same vesting and other terms and conditions as the corresponding RSUs. Dividend equivalents are accumulated and paid when the underlying RSUs vest. Our named executive officers are eligible to participate in our health and welfare programs, Employee Stock Purchase Plan, 401(k) plan, matching charitable gifts program, vacation cash-out program, and other benefit programs on the same basis as other employees. Deferred Compensation Plan. We adopted a nonqualified deferred compensation plan in 2018, effective for deferrals beginning in 2019. The plan allows eligible participants, including our named executive officers, to defer a portion of their base salary and annual cash incentive, subject to plan rules. The deferred compensation plan is unfunded and unsecured. We do not provide any matching contributions under the deferred compensation plan or allow for deferral of RSUs. As an additional security measure for Mr. Cook, the Board requires that he use private aircraft for all business and personal travel. The Board implemented this policy in 2017 in the interests of security and efficiency based on our global profile and the highly visible nature of Mr. Cooks role as CEO. Mr. Cook recognizes imputed taxable income and is not provided a tax reimbursement for personal use of private aircraft. From time to time, our named executive officers other than Mr. Cook may request private aircraft to facilitate travel that is directly and integrally related to the performance of their job duties and when the use of private aircraft will increase efficiency or security associated with a particular trip. Occasionally, spouses or other family members may accompany a named executive officer on these flights. When this occurs, we require the named executive officer to pay the greater of the incremental cost, if any, to accommodate these guests on the flight or the imputed income amount determined using the IRS Standard Industry Fare Level (SIFL) rate. Accordingly, there is no incremental cost to Apple when family members accompany an executive on private business flights. Tax Deductibility of Compensation Expense. Section 162(m) of the Internal Revenue Code generally places a $1 million limit on the amount of compensation a company can deduct in any one year for certain executive officers. While the Compensation Committee considers the deductibility of awards as one factor in determining executive compensation, the Compensation Committee also looks at other factors in making its decisions, as noted above, and retains the flexibility to award compensation that it determines to be consistent with the goals of our executive compensation program even if the awards are not deductible by Apple for tax purposes. RSU Award subject to performance criteria with measurement periods that begin after the June 21, 2013 modification. Despite the Compensation Committees efforts to structure certain elements of our named executive officers compensation granted in 2018 and earlier years in a manner intended to be exempt from Section 162(m) and therefore not subject to its deduction limits, no assurance can be given that compensation otherwise intended to satisfy the requirements for exemption from Section 162(m) in fact will be exempt from its deduction limits because of ambiguities and uncertainties as to the application and interpretation of Section 162(m) and the regulations issued thereunder, including uncertainties created by Federal legislation repealing the previous exemption from Section 162(m)s deduction limit for performance-based compensation, generally effective for taxable years beginning after December 31, 2017. Further, the Compensation Committee reserves the right to modify compensation that was initially intended to be exempt from Section 162(m) if it determines that such modifications are consistent with Apples business needs. Equity Clawback. The named executive officers RSUs are granted pursuant to the terms of our standard RSU agreements, which contain a recoupment provision. These terms require an employee to deliver or otherwise repay to Apple any shares or other amount that may be paid in respect of RSUs in the event the employee commits a felony while employed by Apple, or engages in a breach of confidentiality, commits an act of theft, embezzlement or fraud, or materially breaches any agreement with Apple while employed by Apple or at any time thereafter. Prohibition on Hedging, Pledging, and Short Sales. We prohibit transactions in derivatives of Apple stock, including hedging transactions, for all directors, officers, employees, consultants, and contractors of Apple. In addition, we prohibit pledging of Apple stock as collateral by directors and executive officers of Apple and prohibit short sales of Apple stock by directors and executive officers. Stock Ownership Guidelines. Under our stock ownership guidelines, Mr. Cook is expected to own shares of Apple stock that have a value equal to 10 times his annual base salary. All other executive officers are expected to own shares that have a value equal to three times their annual base salary within five years of the officer first becoming subject to the guidelines. Each executive officer is in compliance with the guidelines. Shares may be owned directly by the individual, owned jointly with or separately by the individuals spouse, or held in trust for the benefit of the individual, the individuals spouse, or the individuals children. Risk Considerations. In establishing and reviewing Apples executive compensation program, the Compensation Committee considers whether the program encourages unnecessary or excessive risk-taking and has concluded that it does not. See the section entitled Board Oversight of Risk Management above for an additional discussion of risk considerations. The following table, footnotes, and related narrative show information regarding the total compensation of each named executive officer for 2018, 2017, and 2016, except in the case of Ms. Adams and Mr. Williams, who were not named executive officers in 2017 or 2016. For 2018, Mr. Cooks annual base salary was $3 million and the annual base salary for each of our other named executive officers was $1 million. The 2018 salary for Ms. Adams reflects the portion of her $1 million annual base salary that she earned from her date of hire through the end of 2018. Because 2017 was a 53-week fiscal year, the 2017 salary amounts reflect an extra week of pay. As described under Executive CompensationCompensation Discussion and Analysis, the named executive officers annual cash incentives are based on the performance of Apple relative to pre-determined financial goals for the year and the performance of the individual named executive officer. 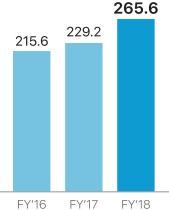 The threshold, target, and maximum payout amounts for each named executive officers 2018 annual cash incentive opportunity are shown in the table entitled Grants of Plan-Based Awards2018. In 2018, Apples performance exceeded the maximum performance goals for both net sales and operating income, resulting in a maximum total payout of each named executive officers annual cash incentive at 400% of annual base salary. The Compensation Committee determined that no downward adjustments would be made based on Apples or an individuals performance and approved the maximum total payout for each named executive officer for 2018. This amount represents: (i) Apples contributions to Mr. Cooks account under its 401(k) plan in the amount of $16,500; (ii) term life insurance premiums paid by Apple in the amount of $2,964; (iii) vacation cash-out in the amount of $57,692; (iv) security expenses in the amount of $310,981, which represents the incremental cost for personal security services provided to Mr. Cook as determined by allocating both direct costs and a percentage of fixed costs incurred by Apple and used to provide personal security services; and (v) personal air travel expenses in the amount of $294,082, which represents the incremental cost to Apple for Mr. Cooks personal use of private aircraft based on hourly flight charges and other variable costs incurred by Apple for such use, including variable fuel charges, departure fees, and landing fees. For security reasons, the Board implemented a policy in 2017 that requires that Mr. Cook use private aircraft for all business and personal travel. This amount represents: (i) Apples contributions to Mr. Maestris account under its 401(k) plan in the amount of $16,192; (ii) term life insurance premiums paid by Apple in the amount of $1,483; and (iii) personal security expenses in the amount of $129. This amount represents: (i) Apples contributions to Ms. Adams account under its 401(k) plan in the amount of $8,250; (ii) term life insurance premiums paid by Apple in the amount of $1,483; (iii) relocation expenses in the amount of $139,418 and associated tax gross up for taxable relocation amounts in the amount of $156,613; and (iv) personal security expenses in the amount of $516. This amount represents: (i) Apples contributions to Ms. Ahrendts account under its 401(k) plan in the amount of $12,375; (ii) term life insurance premiums paid by Apple in the amount of $1,483; (iii) vacation cash-out in the amount of $7,692; (iv) fees for tax services paid by Apple in the amount of $24,855; and (v) personal security expenses in the amount of $537. This amount represents: (i) Apples contributions to Mr. Williams account under its 401(k) plan in the amount of $16,500; (ii) term life insurance premiums paid by Apple in the amount of $37; (iii) vacation cash-out in the amount of $34,615; and (iv) personal security expenses in the amount of $666. The amounts in the salary, bonus, and non-equity incentive plan compensation columns of the Summary Compensation Table2018, 2017, and 2016 reflect actual amounts earned in the relevant years, while the amounts in the stock awards column reflect accounting values. The tables entitled Outstanding Equity Awards at 2018 Year-End and Stock Vested2018 provide further information on the named executive officers potential realizable value and actual value realized with respect to their equity awards. The Summary Compensation Table2018, 2017, and 2016 should be read in conjunction with the Compensation Discussion and Analysis and the subsequent tables and narrative descriptions. The following table shows information regarding the incentive awards granted to the named executive officers for 2018. Apple used its historical stock prices as the basis for the volatility assumptions. The risk-free interest rates were based on U.S. Treasury rates in effect at the time of grant. The expected term was based on the time remaining in the performance period on the grant date. See Note 1Summary of Significant Accounting Policies found in Part II, Item 8, Financial Statements and Supplementary Data in the Notes to Consolidated Financial Statements in the Annual Report on Form 10-K for the year ended September 29, 2018. All Other Stock Awards. Each of the time-based and performance-based RSUs shown in the table entitled Grants of Plan-Based Awards2018 was granted under, and is subject to, the terms of the 2014 Plan. The Compensation Committee administers the 2014 Plan. Time-Based RSUs. The time-based RSUs granted on October 15, 2017 are scheduled to vest in three annual installments commencing on April 1, 2020. The time-based RSUs granted on November 13, 2017 are scheduled to vest in four equal installments on May 13, 2018; November 13, 2018; November 13, 2019; and November 13, 2020. Vesting is generally contingent on each officers continued employment with Apple through the applicable vesting date. Performance-Based RSUs. The performance-based RSUs granted on October 1, 2017 are scheduled to vest on October 1, 2020, subject to the officers continued employment with Apple through the vesting date and satisfaction of the performance condition for the performance period beginning on October 1, 2017 and ending on September 26, 2020. The performance-based RSUs granted on November 13, 2017 are scheduled to vest on October 1, 2020, subject to the officers continued employment with Apple through the vesting date and satisfaction of the performance condition for the performance period beginning on November 13, 2017 and ending on September 26, 2020. As described under Executive CompensationCompensation Discussion and Analysis in the section entitled Other Named Executive Officers Long-Term Equity Awards, in each case, between 0% and 200% of the target number of performance-based RSUs vest depending on Apples Relative TSR percentile compared to the other companies in the S&P 500 over the performance period, with (i) 25% of the target number of performance-based RSUs vesting if Apples Relative TSR performance is at the 25th percentile; (ii) 100% of the target number of performance-based RSUs vesting if Apples Relative TSR performance is above the median at the 55th percentile; and (iii) 200% of the target number of performance-based RSUs vesting if Apples Relative TSR performance is at or above the 85th percentile. If Apples total shareholder return for the performance period is negative, the number of performance-based RSUs that vest is capped at 100% of target. If Apples Relative TSR percentile ranking is above the 25th percentile and between the other levels described above, the portion of the performance-based RSUs that vests is linearly interpolated between the two nearest vesting percentages. Dividend Equivalents. RSUs granted under the 2014 Plan have dividend equivalents, which entitle holders of RSUs to the same dividend value per share as holders of common stock. Dividend equivalents are subject to the same vesting and other terms and conditions as the corresponding RSUs. Dividend equivalents are accumulated and paid when the underlying RSUs vest. At Mr. Cooks request, none of his RSUs participate in dividend equivalents. The following table shows information regarding the outstanding equity awards held by each of the named executive officers as of September 29, 2018. The dollar amounts shown in Columns (d) and (f) are determined by multiplying the number of shares or units shown in Column (c) or (e), as applicable, by $225.74, the closing price of Apples common stock on September 28, 2018, the last trading day of Apples fiscal year. 700,000 time-based RSUs subject to this award are scheduled to vest on August 24, 2021, provided that the officer continues to be employed with Apple through the vesting date. The remaining 1,680,000 time- and performance-based RSUs subject to this award are scheduled to vest in three annual installments commencing on August 24, 2019, provided that the officer continues to be employed with Apple through the applicable vesting date and, with respect to a portion of each installment, that the applicable performance condition is satisfied. The time-based RSUs subject to this award are scheduled to vest in their entirety on April 1, 2019, provided that the officer continues to be employed with Apple through the applicable vesting date. The time-based RSUs subject to this award are scheduled to vest in two annual installments commencing on April 1, 2019, provided that the officer continues to be employed with Apple through the applicable vesting date. A maximum of 200% of the 65,264 target number of performance-based RSUs subject to this award (totaling 130,528 performance-based RSUs) vested on October 1, 2018 based on Apples Relative TSR compared to the other companies in the S&P 500 over the relevant performance period. The target number of performance-based RSUs is shown. As described under Executive CompensationCompensation Discussion and Analysis, in each case, between 0% and 200% of the target number of performance-based RSUs vest depending on Apples Relative TSR compared to the other companies in the S&P 500 over the relevant performance period. The time-based RSUs subject to this award are scheduled to vest in three annual installments commencing on April 1, 2019, provided that the officer continues to be employed with Apple through the applicable vesting date. The performance-based RSUs subject to this award are scheduled to vest on October 1, 2019, provided that the officer continues to be employed with Apple through the vesting date and that the applicable performance condition is satisfied. The performance-based RSUs subject to this award are scheduled to vest on October 1, 2020, provided that the officer continues to be employed with Apple through the vesting date and that the applicable performance condition is satisfied. The time-based RSUs subject to this award are scheduled to vest in three annual installments commencing on April 1, 2020, provided that the officer continues to be employed with Apple through the applicable vesting date. The time-based RSUs subject to this award are scheduled to vest in three equal installments on November 13, 2018; November 13, 2019; and November 13, 2020, provided that the officer continues to be employed with Apple through the applicable vesting date. The performance-based RSUs subject to this award are scheduled to vest on October 1, 2020, provided that the officer continues to be employed with Apple through the vesting date and that the applicable performance condition is satisfied. The following table shows information regarding the vesting during 2018 of RSUs previously granted to the named executive officers. No options were exercised by any named executive officer during 2018. The dollar amounts shown in Column (c) are determined by multiplying the number of shares that vested by the per share closing price of Apples common stock on the vesting date, plus dividend equivalents attributable to such shares in the amount of $1,545,641 for Mr. Maestri; $9,054 for Ms. Adams; $1,478,994 for Ms. Ahrendts; and $1,819,133 for Mr. Williams. At Mr. Cooks request, none of his RSUs participate in dividend equivalents. We do not have any severance arrangements with our named executive officers, and none of the equity awards granted to the named executive officers under Apples equity incentive plans provide for acceleration in connection with a change of control or a termination of employment, other than as noted below in connection with death or disability. Time-Based RSUs. Time-based RSUs provide for partial accelerated vesting of the RSUs scheduled to vest on the next applicable vesting date following termination of employment due to disability and for full accelerated vesting upon death. Performance-Based RSUs. Performance-based RSUs provide for a partial waiver of the service vesting condition upon the death or disability of the award recipient, with the number of shares that vest determined at the end of the performance period, based on actual performance results and the recipients dates of employment during the performance period. The following table shows the estimated amounts that the named executive officers would have become entitled to under the terms of all outstanding RSUs had their employment terminated due to either death or disability on September 28, 2018, the last business day of Apples fiscal year. The estimated values for performance-based RSUs are shown at the maximum potential payout amounts. The dollar amounts are determined by (i) multiplying the number of RSUs that would have been subject to accelerated vesting if the officer had died or become disabled on September 28, 2018, as applicable, by $225.74, the closing price of Apples common stock on that date and (ii) then adding any accumulated dividend equivalents attributable to any such RSUs on that date. The 2018 annual total compensation of our CEO was $15,682,219, the 2018 annual total compensation of our median compensated employee was $55,426, and the ratio of these amounts is 283 to 1. This Proxy Statement contains five proposals requiring shareholder action. The Board has nominated directors Bell, Cook, Gore, Iger, Jung, Levinson, Sugar, and Wagner to be elected to serve on our Board until the next annual meeting of shareholders and until their successors are duly elected and qualified. At the Annual Meeting, proxies cannot be voted for a greater number of individuals than the eight nominees named in this Proxy Statement. Holders of proxies solicited by this Proxy Statement will vote the proxies received by them as directed on the proxy card or, if no direction is made, for the election of the Boards eight nominees. The term of any incumbent director who does not receive the affirmative vote of (i) a majority of the shares present or represented by proxy and voting at the Annual Meeting and (ii) a majority of the shares required to constitute a quorum, and has not earlier resigned, will end on the date that is the earlier of (a) 90 days after the date on which the voting results for the Annual Meeting are determined by the inspector of election, or (b) the date on which the Board selects a person to fill the office held by that director in accordance with Apples bylaws. Each of the directors nominated by the Board has consented to serving as a nominee, being named in this Proxy Statement, and serving on the Board if elected. Each director elected at the Annual Meeting will be elected to serve a one-year term. If any nominee is unable or declines to serve as a director at the time of the Annual Meeting, the proxy holders may vote for any nominee designated by the present Board to fill the vacancy. There are no family relationships among Apples executive officers and directors. The Board recommends that shareholders vote FOR the election of directors Bell, Cook, Gore, Iger, Jung, Levinson, Sugar, and Wagner. Apple has implemented majority voting in uncontested elections of directors. Accordingly, Apples bylaws provide that in an uncontested election of directors the affirmative vote of (i) a majority of the shares present or represented by proxy and voting at the Annual Meeting and (ii) a majority of the shares required to constitute a quorum is required to elect a director. The Audit Committee has re-appointed Ernst & Young LLP as Apples independent registered public accounting firm and as auditors of Apples consolidated financial statements for 2019. Ernst & Young has served as Apples independent registered public accounting firm since 2009. The Audit Committee reviews the performance of the independent registered public accounting firm annually. At the Annual Meeting, our shareholders are being asked to ratify the appointment of Ernst & Young as Apples independent registered public accounting firm for 2019. In the event of a negative vote on this proposal, the Audit Committee will reconsider its selection. 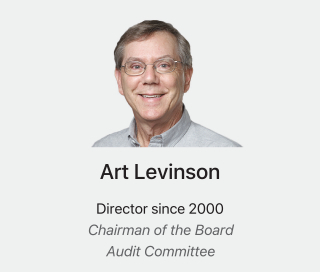 Even if this appointment is ratified, the Audit Committee may, in its discretion, direct the appointment of a different independent registered public accounting firm at any time during the year if the Audit Committee determines that such a change would be in the best interests of Apple and its shareholders. Representatives of Ernst & Young are expected to be present at the Annual Meeting, will have an opportunity to make a statement if they desire to do so, and will be available to respond to questions. The following table shows the fees billed by Apples independent registered public accounting firm for the years ended September 29, 2018 and September 30, 2017. Audit fees relate to professional services rendered in connection with the audit of Apples annual financial statements and internal control over financial reporting, quarterly review of financial statements, and audit services provided in connection with other statutory and regulatory filings. Audit-related fees relate to professional services that are reasonably related to the performance of the audit or review of Apples financial statements. Tax fees relate to professional services rendered in connection with tax compliance and preparation relating to tax returns and tax audits, as well as for tax consulting and planning services. All other fees relate to professional services not included in the categories above, including services related to other regulatory reporting requirements. advance the audit and permissible non-audit services to be performed by the independent registered public accounting firm and the related budget, and that the Audit Committee be provided with quarterly reporting on actual spending. This policy also mandates that Apple may not enter into engagements with Apples independent registered public accounting firm for non-audit services without the express pre-approval of the Audit Committee. In accordance with this policy, the Audit Committee pre-approved all services performed by Apples independent registered public accounting firm in 2018. Approval of Proposal No. 2 requires the affirmative vote of (i) a majority of the shares present or represented by proxy and voting at the Annual Meeting and (ii) a majority of the shares required to constitute a quorum. In accordance with the requirements of Section 14A of the Exchange Act and the related rules of the SEC, our shareholders have the opportunity to cast an annual advisory vote to approve the compensation of our named executive officers as disclosed pursuant to the SECs compensation disclosure rules, which disclosure includes the Compensation Discussion and Analysis, the compensation tables, and the narrative disclosures that accompany the compensation tables (a say-on-pay vote). Our executive compensation program is designed to motivate and reward exceptional performance in a straight-forward and effective way, while also recognizing the remarkable size, scope, and success of Apples business. Apple delivered a year of extraordinary performance and reached many significant milestones in 2018. Net sales grew $36.4 billion to $265.6 billion, and operating income grew $9.6 billion to $70.9 billion, representing 16% year-over-year growth for each of these key performance measures. We believe the compensation paid to our named executive officers for 2018 appropriately reflects and rewards their contributions to our performance and is aligned with the long-term interests of our shareholders. We encourage shareholders to read the Compensation Discussion and Analysis, beginning on page 28 of this Proxy Statement, which describes the details of our executive compensation program and the decisions made by the Compensation Committee in 2018. We value the feedback provided by our shareholders. At the 2018 annual meeting of shareholders, 95% of votes cast supported our executive compensation program. We have discussions with many of our shareholders regarding various corporate governance topics, including executive compensation, and take into account the views of shareholders regarding the design and effectiveness of our executive compensation program. RESOLVED, that the compensation paid to the named executive officers, as disclosed in this Proxy Statement pursuant to the SECs executive compensation disclosure rules, which disclosure includes the Compensation Discussion and Analysis, the compensation tables, and the narrative disclosures that accompany the compensation tables, is hereby approved. As an advisory vote, this proposal is not binding on Apple, the Board, or the Compensation Committee. However, the Compensation Committee and the Board value the opinions expressed by shareholders in their votes on this proposal and will consider the outcome of the vote when making future compensation decisions regarding named executive officers. Approval of Proposal No. 3 requires the affirmative vote of (i) a majority of the shares present or represented by proxy and voting at the Annual Meeting and (ii) a majority of the shares required to constitute a quorum. The number of Shareholder Nominees eligible to appear in proxy materials shall be 20% of the directors then serving or 2, whichever is greater. Supporting Statement: Current proxy access bylaws restrict Shareholder Nominees to 20% of directors rounded down to the nearest whole number. Most S&P 500 companies have adopted proxy access. According to a report by Sidley Austin (https://www.sidley.com/-/media/update-pdfs/2018/02/20180201-corporate-governance-report.pdf), 84% allow either a minimum of 2 directors to be nominated or 25% of the board. That leaves Apple as a distinct outlier with 16% that allow only up to 20% of the board to be nominated by shareholders. However, Apple is worse than most of the 16% of laggards. The most common board size at S&P 500 companies is 11. 20% of 11, rounding down to the nearest whole number is 2. However, Apple has only 8 directors. 20% of 8, rounding down to the nearest whole number is 1. Because shareholders are limited to one nominee at Apple, instead of two, as is the case at most large companies, any shareholder nominee elected under the current bylaws at Apple could be easily isolated and ineffective. They might not even be able to get a second on a motion in a board meeting to discuss important topics. A cost-benefit analysis by CFA Institute, Proxy Access in the United States: Revisiting the Proposed SEC Rule (http://www.cfapubs.org/doi/pdf/10.2469/ccb.v2014.n9.1), found proxy access would benefit both the markets and corporate boardrooms, with little cost or disruption, raising US market capitalization by up to $140.3 billion. Apple has proxy access provisions but they certainly do not meet even the weakest of industry standards. The proponent has submitted a proxy access proposal to Apple every year for the last five years and, in each case, has failed to receive majority support. As described below and in previous years, we continue to believe that the changes advocated by the proponent are not necessary because Apple shareholders already have an effective mechanism for proxy access. Apple has a small Board compared to many public companies, and if approved this proposal could have serious unintended consequences, putting the company and shareholder value at risk. After careful consideration of the varying viewpoints offered by many of our shareholders, the Board amended Apples bylaws to adopt proxy access in December 2015. The bylaws permit a shareholder, or a group of up to 20 shareholders, owning at least 3% of Apples outstanding shares of common stock continuously for at least three years, to nominate and include in Apples annual proxy materials director nominees constituting up to 20% of the Board, provided that the shareholder(s) and nominee(s) satisfy the procedural and eligibility requirements specified in the bylaws. After closely monitoring proxy access developments and engaging with many of our largest shareholders, governance experts, and advisors to discuss evolving market practices and the preferences of our shareholders, the Board adopted enhancements to the secondary elements of the proxy access provisions in our bylaws in December 2016. These enhancements made it easier for shareholders to nominate proxy access candidates by eliminating the requirement that a nominating shareholders loaned shares be recalled at the time the shareholder provides notice to Apple; eliminating the prohibition on re-nomination of a proxy access candidate if the candidate receives a low level of support at the annual meeting; limiting the circumstances under which the maximum number of proxy access candidates is reduced; extending the deadline by which nominating shareholders and proxy access candidates must provide certain information to Apple; narrowing the scope of a nominating shareholders indemnification obligations; and limiting the discretion of the Board to unilaterally interpret the proxy access provisions. 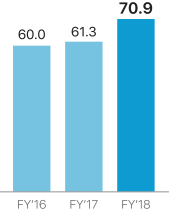 According to the study cited by the proponent, only 65% of the companies in the S&P 500 have adopted proxy access. Moreover, among the companies that have adopted proxy access, there are many different models and approaches. For example, of the companies of any size that have adopted proxy access since January 1, 2015, 22% do not require a minimum of two director nominees. Our proxy access bylaws overall are well within the mainstream of public company practices and share similar features with the proxy access bylaws of many other companies. We strongly believe increasing the potential level of Board representation to the greater of two directors and 20% of the Board could have unintended effects that could negatively impact shareholder value, including promoting the use of proxy access to lay the groundwork for effecting a change of control, encouraging the pursuit of special interests at the expense of a holistic, long-term strategic view, or otherwise disrupting the effective functioning of the Board. Our Board has also shown an ongoing commitment to having highly qualified, independent voices in the boardroom through a robust director nomination and annual self-evaluation process. We are committed to ensuring effective, balanced corporate governance while also continually engaging with shareholders. The Board continues to believe that these objectives are being achieved through Apples current governance processes and that changing our proxy access framework again as outlined by the proposal is unnecessary, unwarranted, and possibly detrimental to shareholder value. Approval of Proposal No. 4 requires the affirmative vote of (i) a majority of the shares present or represented by proxy and voting at the Annual Meeting and (ii) a majority of the shares required to constitute a quorum. Each nominees skills, ideological perspectives, and experience presented in a chart or matrix form. The disclosure shall be presented to the shareholders through the annual proxy statement and the Companys website within six (6) months of the date of the annual meeting and updated on an annual basis. We believe that boards that incorporate diverse perspectives can think more critically and oversee corporate managers more effectively. By providing a meaningful disclosure about potential Board members, shareholders will be better able to judge how well-suited individual board nominees are for the Company and whether their listed skills, experience and attributes are appropriate in light of the Companys overall business strategy. The Companys compliance with Item 407(c)(2)(v) of SEC Regulation S-K requires it to identify the minimum skills, experience, and attributes that all board candidates are expected to possess. True diversity comes from diversity of thought. There is ample evidence that the Company  and Silicon Valley generally  operate in ideological hegemony that eschews conservative people, thoughts, and values. This ideological echo chamber can result in groupthink that is the antithesis of diversity. This can be a major risk factor for shareholders. We believe a diverse board is a good indicator of sound corporate governance and a well-functioning board. Diversity in board composition is best achieved through highly qualified candidates with a wide range of skills, experience, beliefs, and board independence from management. We are requesting comprehensive disclosures about board composition and what qualifications the Company seeks for its Board, therefore we urge shareholders to vote FOR this proposal. The role of our Board is to oversee the CEO and other senior management in the competent and ethical operation of Apple and to assure that the long-term interests of shareholders are being served. Our shareholders have elected a Board that consists of a highly qualified, diverse group of leaders in their respective fields, and the caliber of our Board members reflects the Boards rigorous process for evaluating and recommending potential nominees for election to the Board. The Directors section of this Proxy Statement includes a discussion of the specific skills, qualities, attributes, and experience that led the Board and the Nominating Committee to determine that it is appropriate to nominate each director for election to the Board. The skills, qualities, attributes, and experience of each nominee, and all nominees collectively, are important to the oversight function of the Board because they provide a diverse range of backgrounds and perspectives that enable the directors to engage each other and management to effectively address Apples evolving needs and represent the best interests of Apples shareholders. The Board regularly monitors the mix of skills and experience of its directors in order to assure that the Board has the necessary tools to perform its oversight function effectively. The Board also undertakes an annual self-evaluation process led by the independent Chairman of the Board. These processes facilitate open dialogue, fresh perspectives, and the ability to share diverse points of view. In evaluating potential nominees for election to the Board, the Nominating Committee doesnt look for a set of minimum qualifications. Instead, the Nominating Committee evaluates a variety of attributes, including independence; character; ability to exercise sound judgment; diversity; gender; age; demonstrated leadership; and relevant skills and experience, including financial literacy and other experience in the context of the needs of the Board. The breadth of this evaluation ensures not only that the Board is highly qualified, but also that its members are able to elicit a range of ideas and engage in robust discussion in the course of performing their oversight function. The skills, qualities, attributes, and experience that the Board evaluates when considering a potential nominee do not include ideological perspectives. The Board does not seek to determine any nominees ideological perspectives because the Board does not consider a nominees ideological perspectives to be relevant to the Boards oversight role or the nominees ability to serve as an effective director. The Board considers a wide range of factors in assessing whether each nominee, and all nominees as a group, provides the background, experiences, and attributes necessary to effectively perform the Boards oversight function. The Board believes that the additional disclosure requested by this proposal would not be relevant to the Boards process for identifying director candidates or be useful to shareholders in assessing the diversity of backgrounds, experiences, and attributes that should be, and are, represented on the Board. For these reasons, the Board believes that this proposal is unnecessary. In view of the factors the Nominating Committee and the Board consider when selecting nominees for election, the additional disclosures requested by the proposal would not provide meaningful information to shareholders. Approval of Proposal No. 5 requires the affirmative vote of (i) a majority of the shares present or represented by proxy and voting at the Annual Meeting and (ii) a majority of the shares required to constitute a quorum. Apple knows of no other matters to be submitted to shareholders at the Annual Meeting, other than the proposals referred to in this Proxy Statement. If any other matters properly come before shareholders at the Annual Meeting, it is the intention of the persons named on the proxy to vote the shares represented thereby on such matters in accordance with their best judgment. This section includes the Audit and Finance Committee Report, information about stock ownership and our equity compensation plans, and other general information. 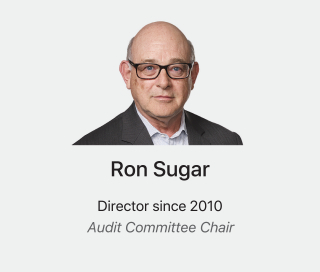 The Audit and Finance Committee consists of four members: Ron Sugar, who serves as the Chair of the Committee, James Bell, Art Levinson, and Sue Wagner. Each member is an independent director under Nasdaq, NYSE, and SEC rules. The Audit and Finance Committee has the duties and powers described in its written charter adopted by the Board. A copy of the charter is available on Apples website at investor.apple.com/corporate-governance.cfm. The Audit and Finance Committee does not itself prepare financial statements or perform audits, and its members are not auditors or certifiers of Apples financial statements. The Audit and Finance Committee is responsible for the appointment, compensation, retention, and oversight of the work performed by Apples independent registered public accounting firm, Ernst & Young LLP. In fulfilling its oversight responsibility, the Audit and Finance Committee carefully reviews the policies and procedures for the engagement of the independent registered public accounting firm, including the scope of the audit, audit fees, auditor independence matters, performance of the independent auditors, and the extent to which the independent registered public accounting firm may be retained to perform non-audit services. Apple maintains an auditor independence policy that, among other things, prohibits Apples independent registered public accounting firm from performing non-financial consulting services, such as information technology consulting and internal audit services. This policy mandates that the Audit and Finance Committee approve in advance the audit and permissible non-audit services to be performed by the independent registered public accounting firm and the related budget, and that the Audit and Finance Committee be provided with quarterly reporting on actual spending. This policy also mandates that Apple may not enter into engagements with Apples independent registered public accounting firm for non-audit services without the express pre-approval of the Audit and Finance Committee. The Audit and Finance Committee has reviewed and discussed the audited financial statements for the year ended September 29, 2018 with Apples management and Ernst & Young. The Audit and Finance Committee has also discussed with Ernst & Young the matters required to be discussed by Auditing Standard No. 1301, Communications with Audit Committees issued by the Public Company Accounting Oversight Board (PCAOB). The Audit and Finance Committee also has received and reviewed the written disclosures and the letter from Ernst & Young required by applicable requirements of the PCAOB regarding Ernst & Youngs communications with the Audit and Finance Committee concerning independence, and has discussed with Ernst & Young its independence. Based on the reviews and discussions referred to above, the Audit and Finance Committee recommended to the Board that the financial statements referred to above be included in Apples Annual Report on Form 10-K for the year ended September 29, 2018 for filing with the SEC. The following table shows information as of January 2, 2019 (the Table Date), unless otherwise indicated, regarding the beneficial ownership of Apples common stock by: (i) each person that Apple believes beneficially holds more than 5% of the outstanding shares of Apples common stock based solely on Apples review of filings with the SEC pursuant to Section 13(d) or 13(g) of the Exchange Act; (ii) each director and nominee; (iii) each named executive officer listed in the table entitled Summary Compensation Table2018, 2017, and 2016 under the section entitled Executive Compensation; and (iv) all directors and executive officers as a group. As of the Table Date, 4,729,803,000 shares of Apples common stock were issued and outstanding. Unless otherwise indicated, all persons named as beneficial owners of Apples common stock have sole voting power and sole investment power with respect to the shares indicated as beneficially owned. In addition, unless otherwise indicated, the address for each person named below is c/o Apple Inc., One Apple Park Way, Cupertino, California 95014. Represents shares of Apples common stock held, options held that were exercisable at the Table Date or within 60 days thereafter, and RSUs held that will vest within 60 days after the Table Date. Does not include RSUs that vest more than 60 days after the Table Date. RSUs are awards granted by Apple and payable, subject to vesting requirements, in shares of Apples common stock. Represents shares of Apples common stock beneficially owned as of December 31, 2017, based on a Schedule 13G/A filed on February 12, 2018, by The Vanguard Group. In such filing, The Vanguard Group lists its address as 100 Vanguard Blvd., Malvern, PA 19355, and indicates that it has sole voting power with respect to 7,357,053 shares of Apples common stock, shared voting power with respect to 1,105,866 shares of Apples common stock, sole dispositive power with respect to 340,190,807 shares of Apples common stock, and shared dispositive power with respect to 8,277,225 shares of Apples common stock. Represents shares of Apples common stock beneficially owned as of December 31, 2017, based on a Schedule 13G/A filed on January 29, 2018, by BlackRock, Inc. In such filing, BlackRock, Inc. lists its address as 55 East 52nd Street, New York, NY 10055, and indicates that it has sole voting power with respect to 274,188,943 shares of Apples common stock, and sole dispositive power with respect to 319,715,585 shares of Apples common stock. Excludes 174,820 RSUs held by Ms. Adams that are not scheduled to vest within 60 days after the Table Date. Excludes 480,018 RSUs held by Ms. Ahrendts that are not scheduled to vest within 60 days after the Table Date. Includes 1,521 RSUs held by Mr. Bell that are scheduled to vest on February 1, 2019. Represents 878,425 shares of Apples common stock held in the name of Mr. Cooks trust and excludes 2,380,000 RSUs held by Mr. Cook that are not scheduled to vest within 60 days after the Table Date. Includes 67,889 shares of Apples common stock that Mr. Gore has the right to acquire by exercise of stock options and 1,521 RSUs held by Mr. Gore that are scheduled to vest on February 1, 2019. Includes 525 shares of Apples common stock held by Mr. Igers spouse and 1,521 RSUs held by Mr. Iger that are scheduled to vest on February 1, 2019. Includes 9,590 shares of Apples common stock that Ms. Jung has the right to acquire by exercise of stock options and 1,521 RSUs held by Ms. Jung that are scheduled to vest on February 1, 2019. Includes 14,000 shares of Apples common stock held by Dr. Levinsons spouse, 107,394 shares of Apples common stock that Dr. Levinson has the right to acquire by exercise of stock options, and 1,521 RSUs held by Dr. Levinson that are scheduled to vest on February 1, 2019. Excludes 480,018 RSUs held by Mr. Maestri that are not scheduled to vest within 60 days after the Table Date. Includes 1,521 RSUs held by Dr. Sugar that are scheduled to vest on February 1, 2019. Includes 1,800 shares of Apples common stock held by Ms. Wagners spouse and 1,521 RSUs held by Ms. Wagner that are scheduled to vest on February 1, 2019. Excludes 480,018 RSUs held by Mr. Williams that are not scheduled to vest within 60 days after the Table Date. Includes 184,873 shares of Apples common stock that directors have the right to acquire by exercise of stock options and 10,647 RSUs held by directors that are scheduled to vest within 60 days after the Table Date. As of the Table Date, no executive officer held any stock options or any RSUs scheduled to vest within 60 days after the Table Date. Excludes 3,994,874 RSUs held by executive officers that are not scheduled to vest within 60 days after the Table Date. Represents less than 1% of the issued and outstanding shares of Apples common stock as of the Table Date. Section 16(a) of the Exchange Act requires Apples officers and directors, and persons who own more than 10% of a registered class of Apples equity securities, to file reports of securities ownership and changes in such ownership with the SEC. Officers, directors, and greater than 10% shareholders also are required by SEC rules to furnish Apple with copies of all Section 16(a) forms they file. Based solely upon a review of the copies of such forms furnished to Apple, and on written representations from the reporting persons, Apple believes that all Section 16(a) filing requirements applicable to Apples directors and officers were timely met during 2018. The following table shows information, as of September 29, 2018, regarding shares of Apples common stock authorized for issuance under Apples equity compensation plans. As of September 29, 2018, other than as described below, no equity securities were authorized for issuance under equity compensation plans not approved by shareholders. The weighted-average exercise price is calculated based solely on the exercise prices of the outstanding stock options and does not reflect the shares that will be issued upon the vesting of outstanding awards of RSUs, which have no exercise price. This table does not include equity awards that have been assumed by Apple in connection with the acquisition of other companies. As of September 29, 2018, an additional 96,950 shares of Apples common stock were subject to outstanding stock options assumed in connection with acquisitions of other companies (with a weighted-average exercise price of $5.92 per share). Shares issued in respect of these assumed awards do not count against the share limits of the 2014 Plan. This number includes the following: 89,900,478 shares subject to outstanding awards granted under the 2014 Plan, of which 139,253 shares were subject to outstanding stock options and 89,761,225 shares were subject to outstanding RSU awards; 2,393,747 shares subject to outstanding awards granted under the Apple Inc. 2003 Employee Stock Plan, of which 11,115 shares were subject to outstanding stock options and 2,382,632 shares were subject to outstanding RSU awards; and 263,410 shares subject to outstanding awards granted under the Non-Employee Director Stock Plan, of which 252,763 shares were subject to outstanding stock options and 10,647 shares were subject to outstanding RSU awards. This number includes 280,192,910 shares available for issuance under the 2014 Plan, 36,541,619 shares reserved for issuance under the Apple Inc. Employee Stock Purchase Plan, and 1,081,715 shares available for issuance under the Non-Employee Director Stock Plan. Shares issued in respect of awards other than stock options and stock appreciation rights granted under the 2014 Plan and the Non-Employee Director Stock Plan count against the shares available for grant under the applicable plan as two shares for every share granted. You are invited to attend Apples 2019 Annual Meeting of Shareholders and vote on the proposals described in this Proxy Statement because you were an Apple shareholder on the Record Date, January 2, 2019. In the interest of saving time and money, Apple has opted to provide the Annual Report on Form 10-K for the year ended September 29, 2018 (the Annual Report) in lieu of producing a glossy annual report. If you requested printed versions by mail, these printed proxy materials also include the proxy card or voting instruction form for the Annual Meeting. Apple uses the internet as the primary means of furnishing proxy materials to shareholders. We are sending a Notice of Internet Availability of Proxy Materials (the Notice of Internet Availability) to our shareholders with instructions on how to access the proxy materials online or request a printed copy of the materials. Shareholders may follow the instructions in the Notice of Internet Availability to elect to receive future proxy materials in print by mail or electronically by email. We encourage shareholders to take advantage of the availability of the proxy materials online to help reduce the environmental impact of our annual meetings and reduce Apples printing and mailing costs. Apples proxy materials are also available at investor.apple.com. Apple has adopted a procedure called householding. Under this procedure, Apple may deliver a single copy of the Notice of Internet Availability and, if you requested printed versions by mail, this Proxy Statement and the Annual Report to multiple shareholders who share the same address, unless Apple has received contrary instructions from one or more of the shareholders. This procedure reduces the environmental impact of our annual meetings and reduces Apples printing and mailing costs. Shareholders who participate in householding will continue to receive separate proxy cards. Upon written or oral request, Apple will deliver promptly a separate copy of the Notice of Internet Availability and, if you requested printed versions by mail, this Proxy Statement and the Annual Report to any shareholder that elects not to participate in householding. If you are receiving more than one copy of the proxy materials at a single address and would like to participate in householding, please contact the bank, broker, or other organization that holds your shares to request information about eliminating duplicate mailings. You have properly voted by proxy online, by phone, or by submitting a proxy card or voting instruction form by mail. Broker non-votes and abstentions are counted for purposes of determining whether a quorum is present. If a quorum is not present, we may propose to adjourn the Annual Meeting to solicit additional proxies and reconvene the Annual Meeting at a later date. Apple is paying the costs of the solicitation of proxies. Apple has retained Georgeson LLC to assist in the distribution of proxy materials and the solicitation of proxies from brokerage firms, fiduciaries, custodians, and other similar organizations representing beneficial owners of shares for the Annual Meeting. We have agreed to pay Georgeson a fee of approximately $15,500 plus out-of-pocket expenses. You may contact Georgeson at (866) 828-4304. Obtaining beneficial owners voting instructions. In addition to solicitations by mail, the proxy solicitor and Apples directors, officers, and employees, without additional compensation, may solicit proxies on Apples behalf in person, by phone, or by electronic communication. Apples fiscal year is the 52- or 53-week period that ends on the last Saturday of September. Apples 2018 fiscal year included 52 weeks and ended on September 29, 2018. Information presented in this Proxy Statement is based on Apples fiscal calendar, other than references to particular years in the biographies of our directors and executive officers, which refer to the calendar years. Each share of Apples common stock has one vote on each matter. Only shareholders of record as of the close of business on the Record Date are entitled to vote at the Annual Meeting. As of the Record Date, there were 4,729,803,000 shares of Apples common stock issued and outstanding, held by 24,000 shareholders of record. In addition to shareholders of record of Apples common stock, beneficial owners of shares held in street name as of the Record Date can vote using the methods described below. Shareholder of Record. If your shares are registered directly in your name with Apples transfer agent, Computershare Trust Company, N.A., you are the shareholder of record with respect to those shares. Beneficial Owner of Shares Held in Street Name. If your shares are held in an account at a bank, broker, or other organization, then you are the beneficial owner of shares held in street name. As a beneficial owner, you have the right to instruct the person or organization holding your shares how to vote your shares. Most individual shareholders are beneficial owners of shares held in street name. Online. You may vote by proxy by visiting proxyvote.com and entering the control number found in your Notice of Internet Availability. The availability of online voting may depend on the voting procedures of the organization that holds your shares. In Person. You may vote in person at the Annual Meeting by requesting a ballot from an usher. Only eligible shareholders who have registered in advance and have a valid confirmation of registration will be admitted to the Annual Meeting. If you are a beneficial owner of shares held in street name and wish to vote in person at the Annual Meeting, in addition to registering to attend the meeting in person, you must also obtain a legal proxy from the organization that holds your shares. A legal proxy is a written document that authorizes you to vote your shares held in street name at the Annual Meeting. Please contact the organization that holds your shares for instructions regarding obtaining a legal proxy. You must bring a copy of the legal proxy to the Annual Meeting. In order for your vote to be counted, you must hand both the copy of the legal proxy and your completed ballot to an usher to be provided to the inspector of election. Phone. If you request printed copies of the proxy materials by mail, you will receive a proxy card or voting instruction form and you may vote by proxy by calling the toll free number found on the card or form. The availability of phone voting may depend on the voting procedures of the organization that holds your shares. Mail. If you request printed copies of the proxy materials by mail, you will receive a proxy card or voting instruction form and you may vote by proxy by filling out the card or form and returning it in the envelope provided. All shares represented by valid proxies received prior to the taking of the vote at the Annual Meeting will be voted and, where a shareholder specifies by means of the proxy a choice with respect to any matter to be acted upon, the shares will be voted in accordance with the shareholders instructions. Even if you successfully register and plan on attending the Annual Meeting in person, we encourage you to vote your shares in advance online, by phone, or by mail to ensure that your vote will be represented at the Annual Meeting. Online. You may change your vote using the online voting method described above, in which case only your latest internet proxy submitted prior to the Annual Meeting will be counted. In Person. You may revoke your proxy and change your vote by attending the Annual Meeting and voting in person. 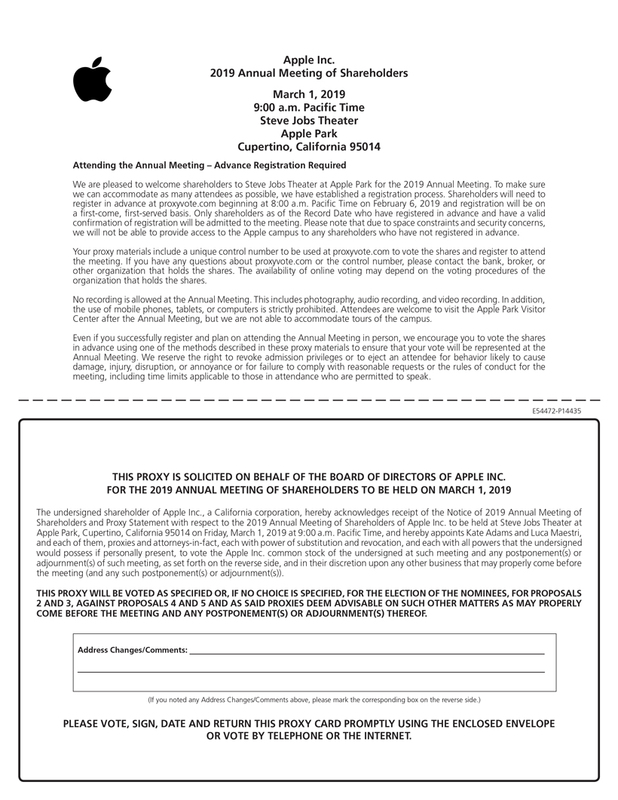 However, your attendance at the Annual Meeting will not automatically revoke your proxy unless you properly vote at the Annual Meeting or specifically request that your prior proxy be revoked by delivering a written notice of revocation prior to the Annual Meeting to Apples Secretary at One Apple Park Way, MS: 169-5GC, Cupertino, California 95014. Only eligible shareholders who have registered in advance and have a valid confirmation of registration will be admitted to the Annual Meeting. Phone. You may change your vote using the phone voting method described above, in which case only your latest telephone proxy submitted prior to the Annual Meeting will be counted. Mail. You may revoke your proxy and change your vote by signing and returning a new proxy card or voting instruction form dated as of a later date, in which case only your latest proxy card or voting instruction form received prior to the Annual Meeting will be counted. then the persons named as proxy holders, Kate Adams and Luca Maestri, will vote your shares in the manner recommended by the Board on all matters presented in this Proxy Statement and as they may determine in their best judgment with respect to any other matters properly presented for a vote at the Annual Meeting. Beneficial Owners of Shares Held in Street Name. If you are a beneficial owner of shares held in street name and do not provide the broker that holds your shares with specific voting instructions, then such broker may generally vote your shares in their discretion on routine matters, but cannot vote on non-routine matters. The ratification of the appointment of Ernst & Young LLP as Apples independent registered public accounting firm for 2019 (Proposal No. 2). A broker or other nominee may generally vote in their discretion on routine matters, and therefore no broker non-votes are expected in connection with Proposal No. 2. Each of shareholder proposals No. 4 and No. 5. If the organization that holds your shares does not receive instructions from you on how to vote your shares on a non-routine matter, that organization will inform the inspector of election that it does not have the authority to vote on the matter with respect to your shares. This is generally referred to as a broker non-vote. Therefore, broker non-votes may exist in connection with Proposal No. 1 and Proposals No. 3 through No. 5. With respect to the election of directors (Proposal No. 1), Apples bylaws provide that, in an uncontested election of directors, the affirmative vote of (i) a majority of the shares present or represented by proxy and voting at the Annual Meeting and (ii) a majority of the shares required to constitute a quorum is required to elect a director. An uncontested election of directors means an election of directors in which the number of candidates for election does not exceed the number of directors to be elected by the shareholders at that election. Approval of Proposals No. 2 through No. 5 requires, in each case, the affirmative vote of both (i) a majority of the shares present or represented by proxy and voting at the Annual Meeting and (ii) a majority of the shares required to constitute a quorum. Broker non-votes and abstentions are counted for purposes of determining whether a quorum is present. Only FOR and AGAINST votes are counted for purposes of determining the votes received in connection with each proposal. Broker non-votes and abstentions will have no effect on determining whether the affirmative vote constitutes a majority of the shares present or represented by proxy and voting at the Annual Meeting. In addition, for each proposal, the affirmative vote equal to a majority of the shares necessary to constitute a quorum is also required for approval. Therefore, broker non-votes and abstentions could prevent the election of a director or the approval of a proposal because they do not count as affirmative votes. As necessary to meet applicable legal requirements. If you write comments on your proxy card or ballot, the proxy card or ballot may be forwarded to Apples management and the Board to review your comments. Preliminary voting results will be announced at the Annual Meeting. Final voting results will be tallied by the inspector of election after the taking of the vote at the Annual Meeting. Apple will publish the final voting results in a Current Report on Form 8-K filed with the SEC within four business days following the Annual Meeting. Proposals and director nominations must be sent either by mail to Apples Secretary at One Apple Park Way, MS: 169-5GC, Cupertino, California 95014, or by email to shareholderproposal@apple.com. Matters for inclusion in the proxy materials for the 2020 annual meeting of shareholders, other than nominations of directors, must be received on or before September 10, 2019. All proposals must comply with Rule 14a-8 under the Exchange Act. Matters for consideration at the 2020 annual meeting of shareholders, but not for inclusion in the proxy materials, must be received no earlier than the close of business on November 2, 2019 and no later than the close of business on December 2, 2019. The proposal must be submitted by a shareholder of record and must set forth the information required by Apples bylaws. If you are a beneficial owner of shares held in street name, you can contact the organization that holds your shares for information about how to register your shares directly in your name as a shareholder of record. A shareholder, or group of up to 20 shareholders, that has owned continuously for at least three years shares of Apple stock representing an aggregate of at least 3% of our outstanding shares, may nominate and include in Apples proxy materials director nominees constituting up to 20% of Apples Board, provided that the shareholder(s) and nominee(s) satisfy the requirements in Apples bylaws. Notice of proxy access director nominees must be received no earlier than the close of business on August 11, 2019 and no later than the close of business on September 10, 2019. Director nominations that a shareholder intends to present at the 2020 annual meeting of shareholders, but does not intend to have included in Apples proxy materials, must be received no earlier than the close of business on November 2, 2019 and no later than the close of business on December 2, 2019. Notice of director nominations must be submitted by a shareholder of record and must set forth the information required by Apples bylaws. If you are a beneficial owner of shares held in street name, you can contact the organization that holds your shares for information about how to register your shares directly in your name as a shareholder of record. Apple Inc. 2019 Annual Meeting of Shareholders March 1, 2019 9:00 a.m. Pacific Time Steve Jobs Theater Apple Park Cupertino, California 95014 Attending the Annual Meeting  Advance Registration Required We are pleased to welcome shareholders to Steve Jobs Theater at Apple Park for the 2019 Annual Meeting. To make sure we can accommodate as many attendees as possible, we have established a registration process. Shareholders will need to register in advance at proxyvote.com beginning at 8:00 a.m. Pacific Time on February 6, 2019 and registration will be on a first-come, first-served basis. Only shareholders as of the Record Date who have registered in advance and have a valid confirmation of registration will be admitted to the meeting. Please note that due to space constraints and security concerns, we will not be able to provide access to the Apple campus to any shareholders who have not registered in advance. Your proxy materials include a unique control number to be used at proxyvote.com to vote the shares and register to attend the meeting. If you have any questions about proxyvote.com or the control number, please contact the bank, broker, or other organization that holds the shares. The availability of online voting may depend on the voting procedures of the organization that holds the shares. No recording is allowed at the Annual Meeting. This includes photography, audio recording, and video recording. In addition, the use of mobile phones, tablets, or computers is strictly prohibited. Attendees are welcome to visit the Apple Park Visitor Center after the Annual Meeting, but we are not able to accommodate tours of the campus. Even if you successfully register and plan on attending the Annual Meeting in person, we encourage you to vote the shares in advance using one of the methods described in these proxy materials to ensure that your vote will be represented at the Annual Meeting. We reserve the right to revoke admission privileges or to eject an attendee for behavior likely to cause damage, injury, disruption, or annoyance or for failure to comply with reasonable requests or the rules of conduct for the meeting, including time limits applicable to those in attendance who are permitted to speak. E54472-P14435 THIS PROXY IS SOLICITED ON BEHALF OF THE BOARD OF DIRECTORS OF APPLE INC. FOR THE 2019 ANNUAL MEETING OF SHAREHOLDERS TO BE HELD ON MARCH 1, 2019 The undersigned shareholder of Apple Inc., a California corporation, hereby acknowledges receipt of the Notice of 2019 Annual Meeting of Shareholders and Proxy Statement with respect to the 2019 Annual Meeting of Shareholders of Apple Inc. to be held at Steve Jobs Theater at Apple Park, Cupertino, California 95014 on Friday, March 1, 2019 at 9:00 a.m. Pacific Time, and hereby appoints Kate Adams and Luca Maestri, and each of them, proxies and attorneys-in-fact, each with power of substitution and revocation, and each with all powers that the undersigned would possess if personally present, to vote the Apple Inc. common stock of the undersigned at such meeting and any postponement(s) or adjournment(s) of such meeting, as set forth on the reverse side, and in their discretion upon any other business that may properly come before the meeting (and any such postponement(s) or adjournment(s)). THIS PROXY WILL BE VOTED AS SPECIFIED OR, IF NO CHOICE IS SPECIFIED, FOR THE ELECTION OF THE NOMINEES, FOR PROPOSALS 2 AND 3, AGAINST PROPOSALS 4 AND 5 AND AS SAID PROXIES DEEM ADVISABLE ON SUCH OTHER MATTERS AS MAY PROPERLY COME BEFORE THE MEETING AND ANY POSTPONEMENT(S) OR ADJOURNMENT(S) THEREOF. Address Changes/Comments: (If you noted any Address Changes/Comments above, please mark the corresponding box on the reverse side.) PLEASE VOTE, SIGN, DATE AND RETURN THIS PROXY CARD PROMPTLY USING THE ENCLOSED ENVELOPE OR VOTE BY TELEPHONE OR THE INTERNET.